Home > Article > How Unique was Slavery at the Cape? The first slaves arrived at the Cape in 1658, despite Jan van Riebeeck's several prior attempts at requesting slaves for the settlement from the Heren XVII. On 28 March 1658, the Dutch merchantman, the Amersfoort, arrived in Table Bay with a valuable cargo of 174 slaves. Henceforth, the Cape entered the global stage of slaveholding societies. 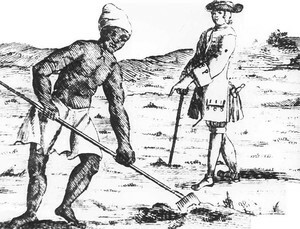 Slavery in the early Cape Colony however took on a completely unique form in comparison to existing slave societies elsewhere in the world at the time, most notably those in the West Indies and Caribbean. Studies done on colonial era slave societies across the globe show how communities of slaves “developed a ‘world’ of their own, shaped by common cultural traditions, religious beliefs and relatively stable family units.” [i] This was however not possible in the Dutch-ruled Cape Colony. Some would go so far as to claim that no other slave-holding society in the world had such a culturally diverse slave population, nor one in which the cultures of the slaves so intricately meshed with those of the slave-owners with such profound effects. [ii] Most notably however, it was the unique features of Cape slavery which prevented the slave population from successfully unifying and forming an effective resistance – as was achieved in the Caribbean and elsewhere. Slaves brought to the early Cape originated almost exclusively from five different regions: Bengal, Southern India, Sri Lanka, Madagascar, Indonesia and the East African coast. Slaves were bought from the slave markets of Batavia, Chinsura, Cochin, Boina, Delagoa Bay or Mozambique before being sent to the Cape, often semi-illegally as the ‘cargo’ of officials and sailors on the ships of the VOC. Others arrived in a more regularized manner off the large slaving ships of the French and the Portuguese en route to the Americas. While we don’t have an accurate representation of the proportion of slave origins at the Cape, we do know from the records available that the Malagasies were the largest group, while in the last years of the slave trade there was a rise in the number of East Africans brought in as agricultural labourers. In the earlier years of the Colony and in Cape Town itself however the Indonesians, who formed the basis of the Cape Malay community, were the most numerous. Slaves arriving at the Cape thus had very little in common with one another. Not only did they originate from vastly different regions with diverse cultures, but many too had to deal with a language barrier. The three languages in general use at the Cape in the eighteenth Century were Dutch, Portuguese Creole and Malay. Those slaves originating from India and the East Indies spoke a combination of Indian and Indonesian dialects as well as Portuguese. Madagascan slaves spoke Malagasy while slaves originating from East Africa had their own languages to communicate. Furthermore, the way in which slaves were individually acquired through sales from Cape Town meant that it was incredibly unlikely to have a unit of slaves working on a farm with a common origin, language or culture. This is in vast contrast to the situation in the Caribbean and the Americas where the majority of slaves from West Africa possessed a common place of origin, language and shared cultural heritage. The formation of a uniform slave culture or society was further affected by the inability of the slave population to effectively reproduce itself. This was due in part to the fact that the number of slave men outnumbered the number of slave women by four to one. [iii] Low fertility and high mortality rates of the slaves themselves were also certainly contributing factors. The lack of generational continuity thus made it increasingly difficult to develop a sense of community. In other slave societies religious organisations or institutions played a vital role in creating a sense of shared community amongst slaves. In the Cape however, up until Islam became prominent in the late eighteenth century, there were no signs of religious organisations amongst the slaves. While some slaves had been baptised into the Reformed Church this was never accompanied by any sense of religious community. It was only much later in the early nineteenth Century, with the arrival of missionaries, that slaves were able to contribute to the life of the church and its community. Slave-holdings in the city itself however were larger in size, less isolated and thus more fertile to the eventual creation of a unique slave culture and identity, albeit only in the waning years of slavery at the Cape. Cape Town was a mercantile community, the centre of the colony’s administration and a bustling hub of activity and trading. Slaves in the Cape thus were able to have a wide variety of occupations outside of their usual household chores. Many were artisans; the likes of butchers, bakers, masons, carpenters and potters. There was however a distinction between unskilled and skilled domestic slaves. Some were even sent to town by their masters to sell produce with the strict order to bring back as much money as possible, failing which they’d often be beaten. While the emergence of the unique Cape Malay community amongst the urban slaves of Cape Town is irrefutable, it is the exception rather than the rule. The majority of slaves in the Cape Colony as a whole were rural slaves, scattered amongst the isolated farms of the countryside. The failure of unification amongst the slaves ultimately affected their ability to successfully plan and execute a large scale-rebellion, as can be seen in the New World. Attempts at rebellion and resistance were more often than not fragmented in nature and effectively crushed and punished by the Colonial powers at hand. The slave rebellion led by Louis van Mauritius on the 27 October 1808 is one of several examples of this. The group of over 300 mutinous slaves marched through the rural districts, gathering even more support from willing slaves and Khoikhoi labourers along the way. It wasn’t long however before the Governor of the Cape, the Earl of Caledon, ordered Infantry and Cavalry to meet the group of resisters just outside of present-day Salt River. The troops captured 326 of the marchers, 47 were put on trial, 11 sentenced to death for ‘active participation, while the 9 leaders of the insurrection were publicly hung. Although widespread slave resistance at the Cape was both uncommon and unsuccessful this does not mean that the Cape slaves acquiesced in their slavery. Instead they expressed their discontent in many other ways, the most popular of which was through desertion. Slaves were left with little other option but to fight as individuals with no possibility of a culture of resistance which could encompass them all. It was thus the very diversity of the slaves’ ethnic origins and the piecemeal nature of the Cape slave trade which caused processes of community-building and acculturation to become stunted. The majority of Cape slaves were thus unable to create any communality to transcend the individualisation of their enslavement and ultimately strengthen their ability to effectively resist.